Oh Cupcakes, who doesn't love a good cupcake these days. From all the cupcake bakeries to cupcake baking competitions on TV. They seam to be the "It" sweet treat. 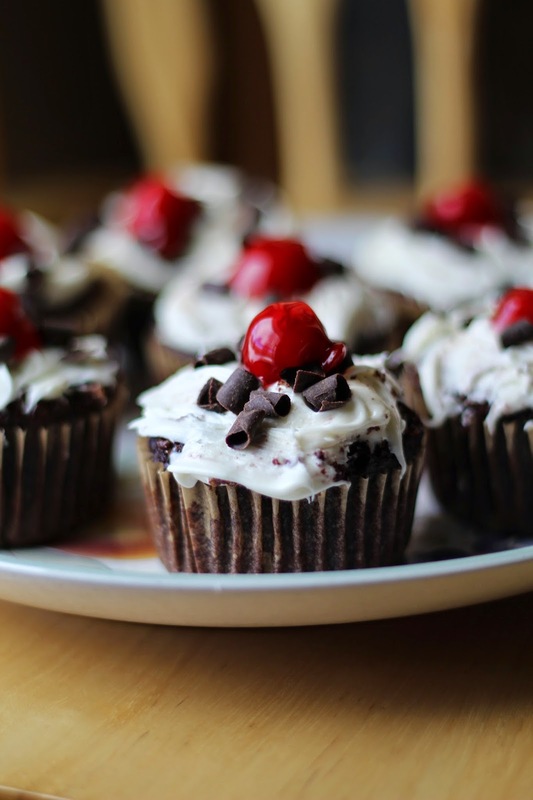 Today I thought I'd share the perfect Black Forest cupcake recipe. And let you in on a little secret. The recipe includes a boxed cake mix. I did a little twist on the classic German cake, instead of doing whipped cream I did Cream Cheese frosting. But go right ahead and do whipped cream if you'd prefer. Every Sunday since I can remember we've gone to my Grandmothers for lunch, so today for an after lunch treat I made these cupcakes and everyone seamed to love them. I hope you do too! In a bowl or stand mixer. Add all 4 eggs and beat. Once beaten add cake mix and extra flour. Mix. Once batter is mixed line 24 cup cake tins with paper liners. Then pour in each liner 2 Tablespoons of batter, once you've done that add the Cherry pie filling. 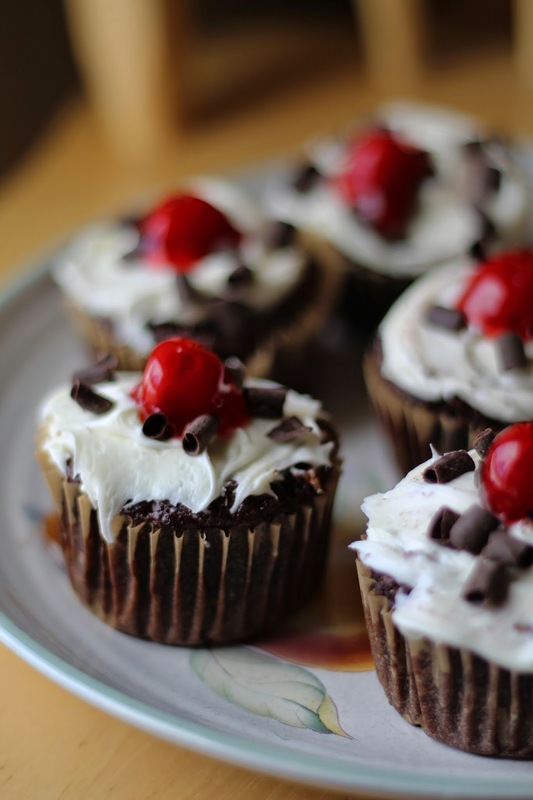 I added 3 Cherries and a bit of the syrup to each cupcake. After you've done that fill the cupcake liner until just under 1/4 inch full. And bake for 18 minutes. Combine all ingredients in stand mixer, Mix until all combined. Once the mixture looks like frosting beat on high for a couple minutes until light and fluffy. I then sprinkled on Dark Chocolate shavings and placed 1 Cherry on top. I used the pie Cherries I just didn't use the syrup. I have a party coming up and this looks like a great idea :) Do you think they will stay good for 4-5 days? Do I have to freeze them for them to stay good? Because the party is on a Friday night and I will have to make these the previous Sunday as I have no other time in between! Otherwise i have to order online valentines day cake. I am sure you could freeze the cupcakes. I wouldn't frost them until the day of or night before the party.